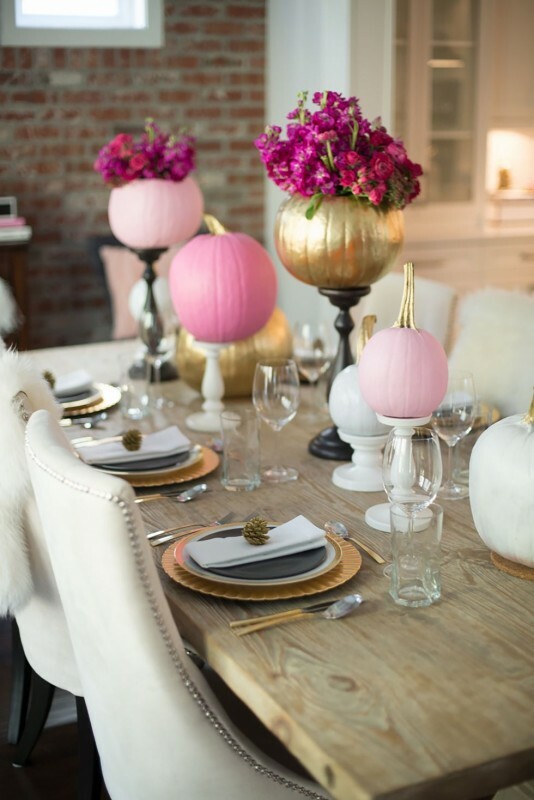 Nothing looks better against a dark Halloween tablescape than a pop of pink. 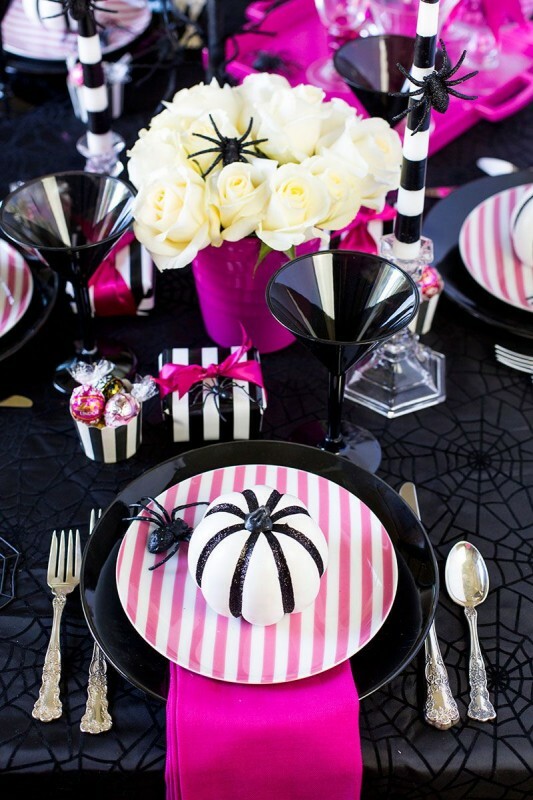 Here, Courtney Whitmore of Pizzazzerie used hot pink cloth napkins and striped plates to make these otherwise creepy Halloween table decorations a little bit luxe. 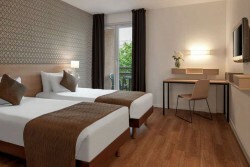 Orange is not a mandatory part of your Halloween color palette. An all-black affair is equally festive, but much more sophisticated. 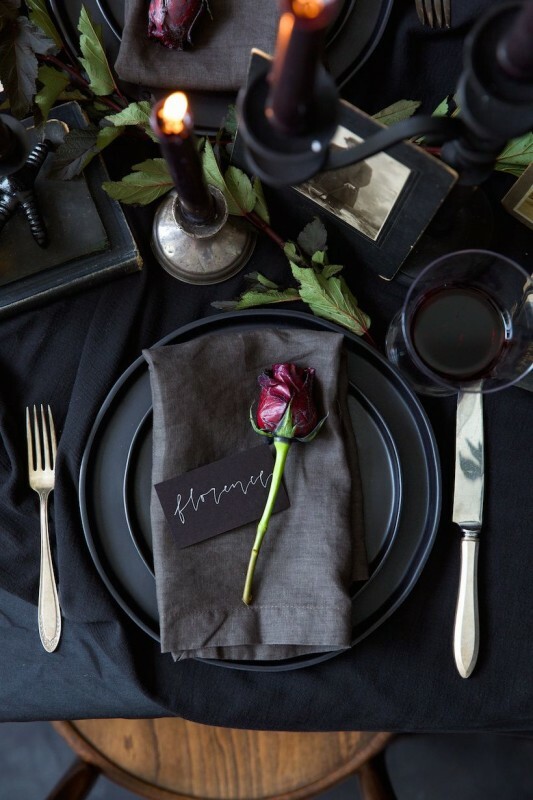 Chanel Dror of Camille Styles designed this spread to be hauntingly elegant, using dark and mysterious flora, eerie candle light, and plenty of black table decor. 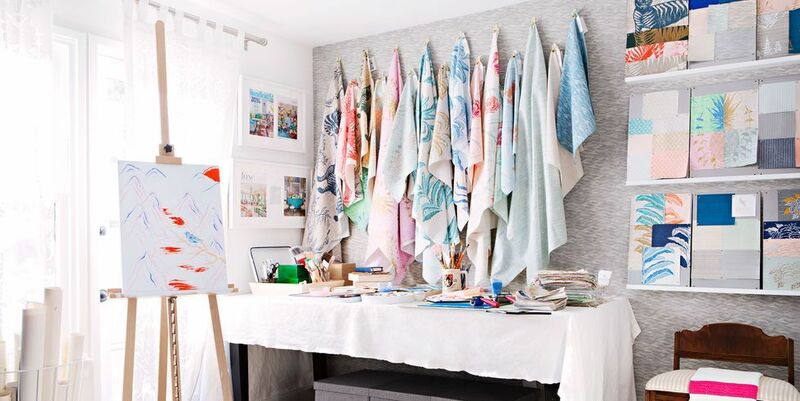 If you want your table to be festive without screaming for attention, dress up your everyday decor with a few statement pieces. 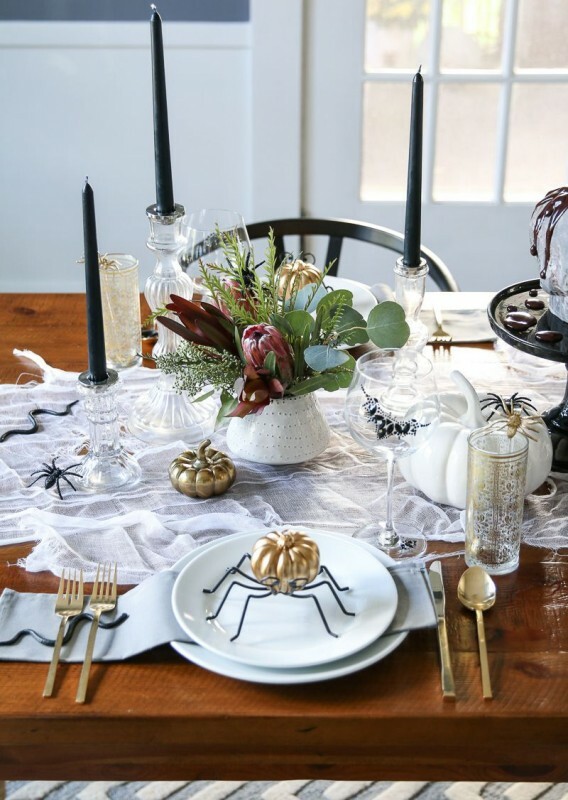 Michael Wurm Jr. of Inspired by Charm styled a stunning fall floral arrangement against a white table cloth and white china, and accessorized with cute spider pumpkin place card holders to complete the holiday dinner setting. 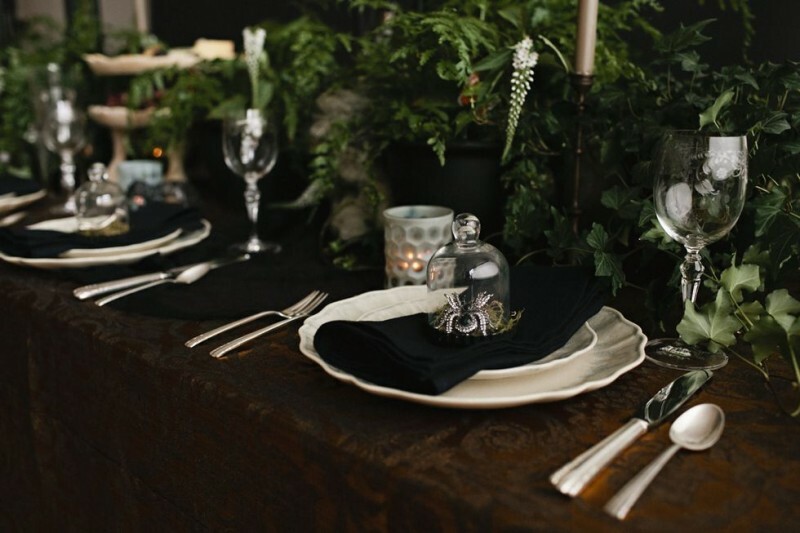 Lush greenery can add a spooky forest-like element to your party. 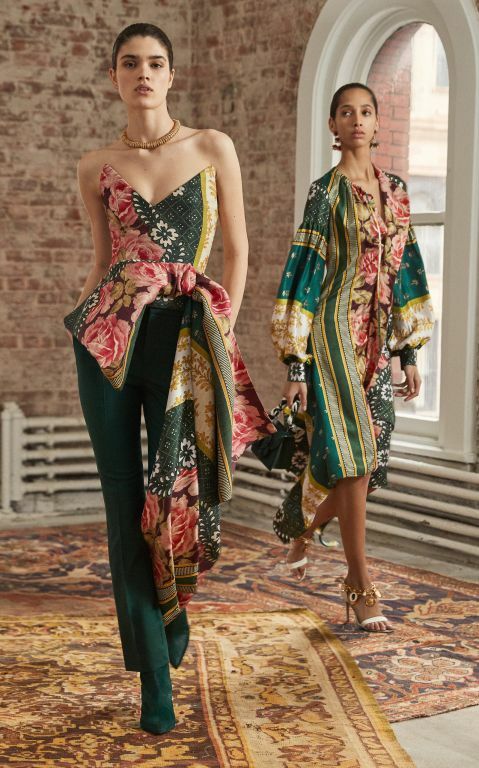 The greens here, styled by Cassandra LaValle of Coco Kelly, are offset by a dark tablescape and jeweled spiders that are both creepy and glamorous. 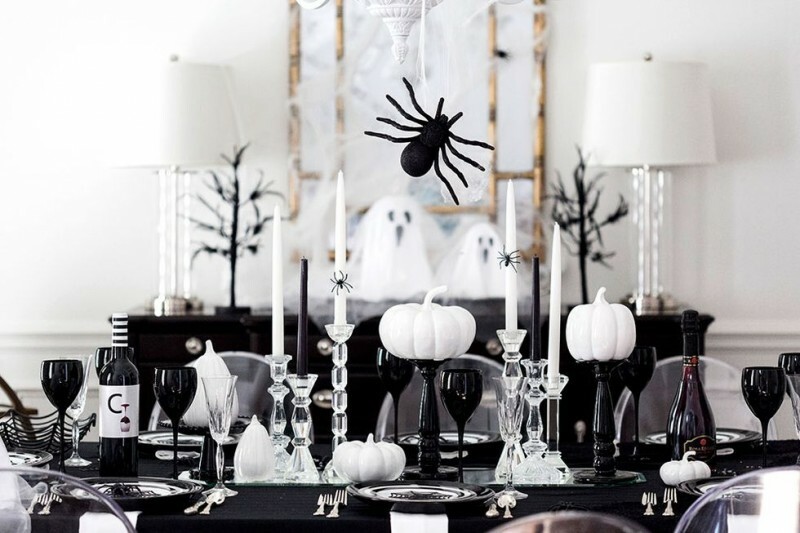 A black-and-white theme here is so classic, your guests will almost forget that it's Halloween...until they see the spiders and ghosts subtly worked into the decor. Courtney Whitmore of Pizzazzerie accented the table with candlesticks and ceramic white pumpkins for an elegant fall vibe. 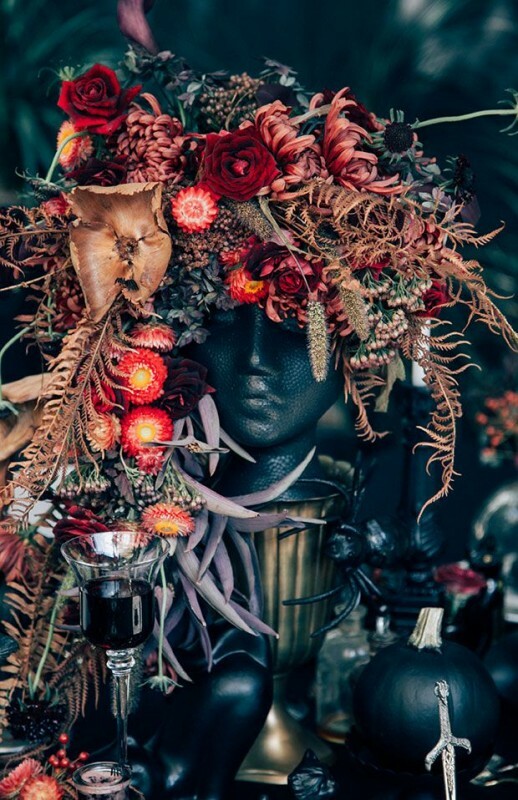 When it comes to Halloween, we can't think of a more fitting centerpiece than this spooky (yet beautiful) Medusa-inspired floral arrangement. 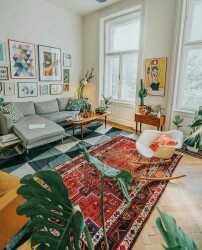 You would never guess the elements used here were completely thrifted by Justina Blakeney of The Jungalow, giving them an eerie old-world feel. 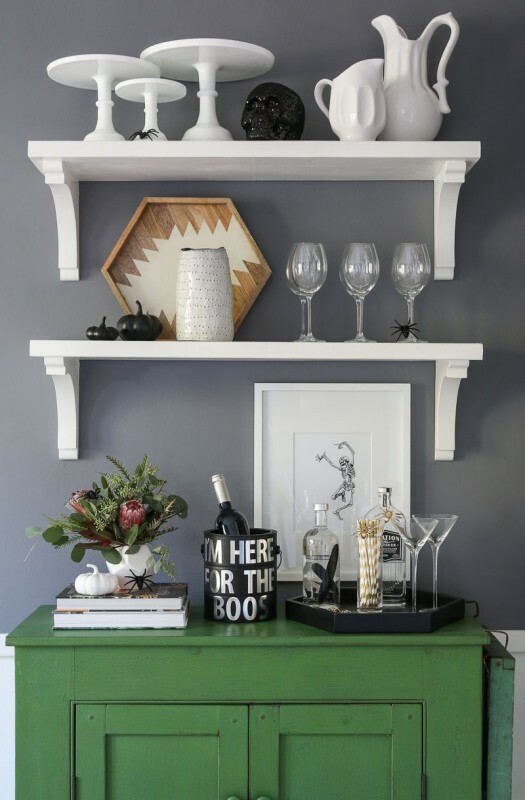 Don't forgo festivity at your drink station: Black skulls, pumpkins and spiders offer the perfect Halloween touch without going overboard, as shown in a vignette designed by Inspired By Charm. We are fully support the "I'm Here For The BOOs" wine bucket. Black and gold should be the holiday's official colors, if you ask us. 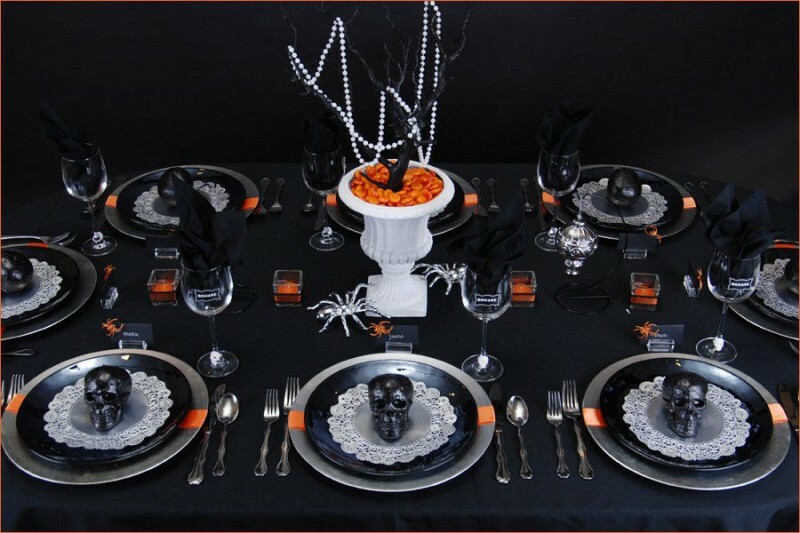 This Halloween tablescape designed by Anno Domini Home layers the two glamorous tones perfectly, punctuating the lavish look with a skull motif. 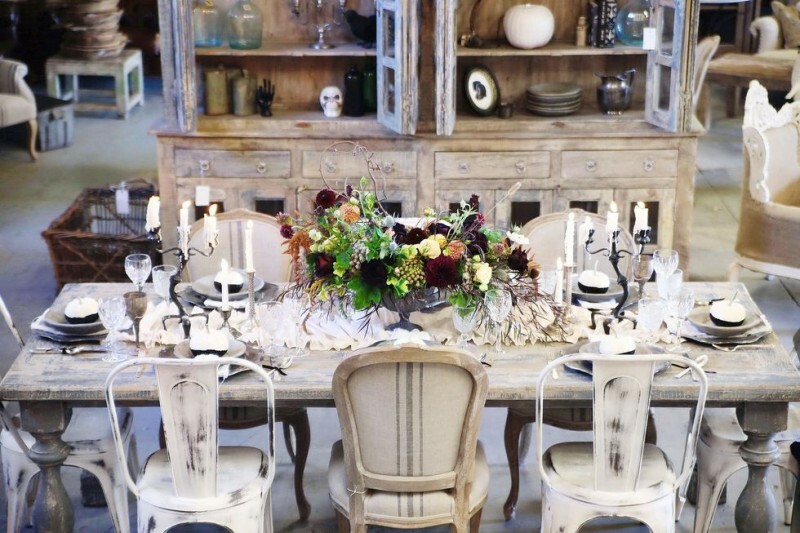 A rustic table can be easily elevated to Halloween party chic with a few holiday decor swaps. 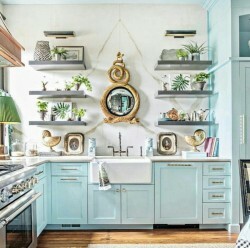 Here, Alicia Winnett of Alicia Fashionista, and Best Day Ever topped a table with pink, gold and white pumpkins, some even serving as vases for beautiful blooms. 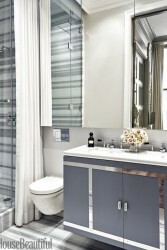 She kept the flatware classic and minimalist, letting the centerpieces be the stars of the show. 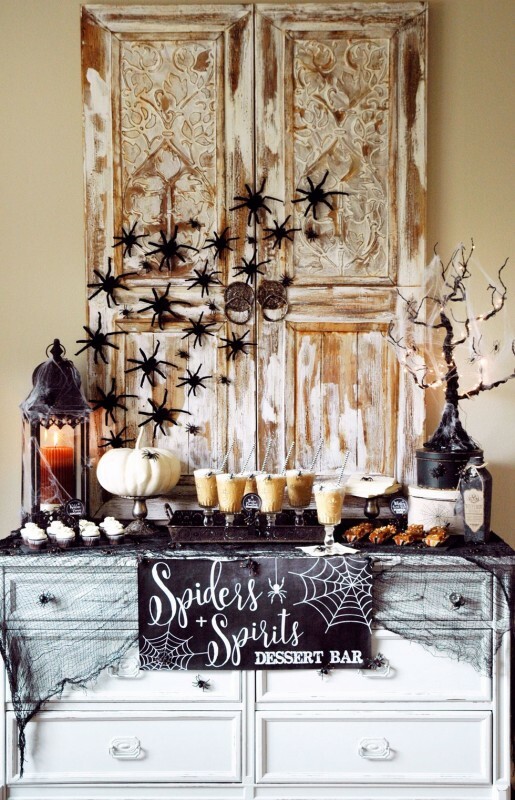 For a themed dessert bar, Jessica Kirkland of Pen + Paper Flowers used black netting, crawling spiders, "cobwebs" and lanterns for a cute-but-spooky effect. 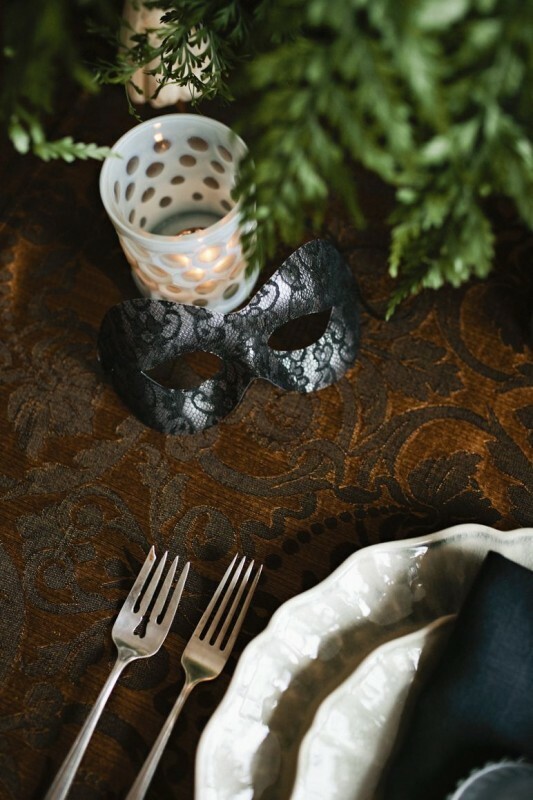 Add a little mystery to your dinner table with chic masquerade masks. These fun party favors double as Halloween decor, and give your party a fun and unexpected twist. The rust orange tablecloth, styled by Cassandra LaValle of Coco Kelly, also satisfies the need for a classic Halloween color scheme. 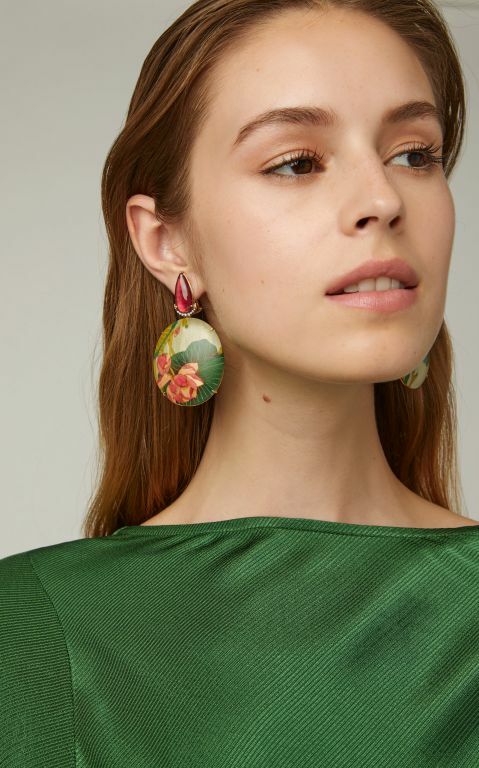 Scary and chic, this is as festive as it gets. 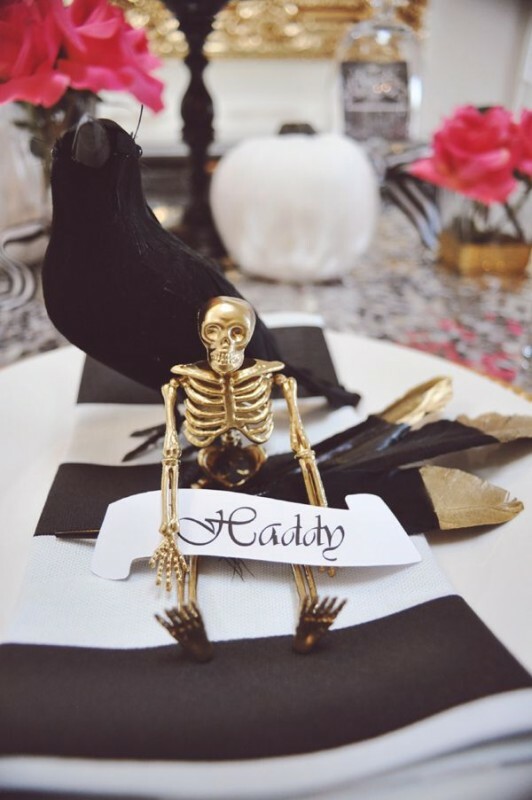 A gilded skeleton holds onto a name card in this design by Haddy Tapia-Clark from House of Creative Designs, as featured on A Blissful Nest. 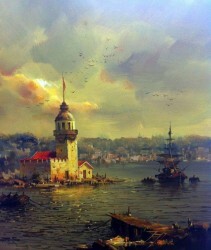 A faux crow and some black-and-gold feathers lurk in the background, perfectly completing the look. 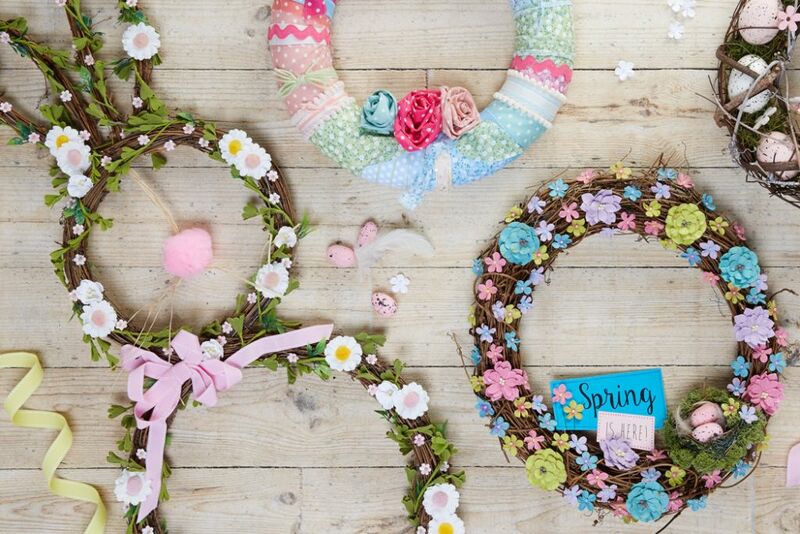 Opt for a traditional floral centerpiece...but style it in a skull vase for a playful nod to the holiday at hand. 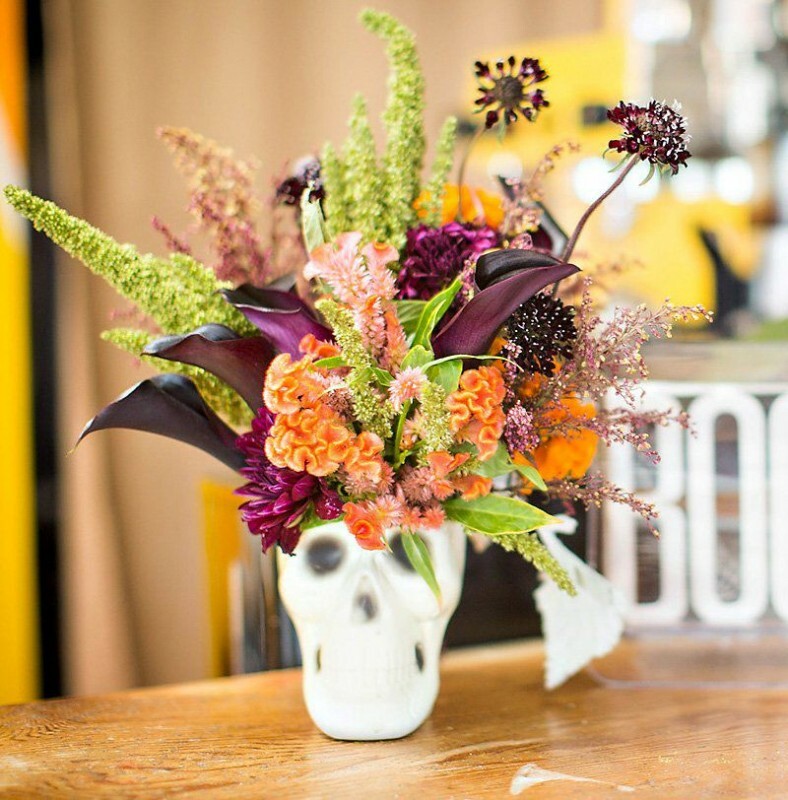 This arrangement of fall blooms is by Jennifer Sbranti of Hostess with the Mostess. 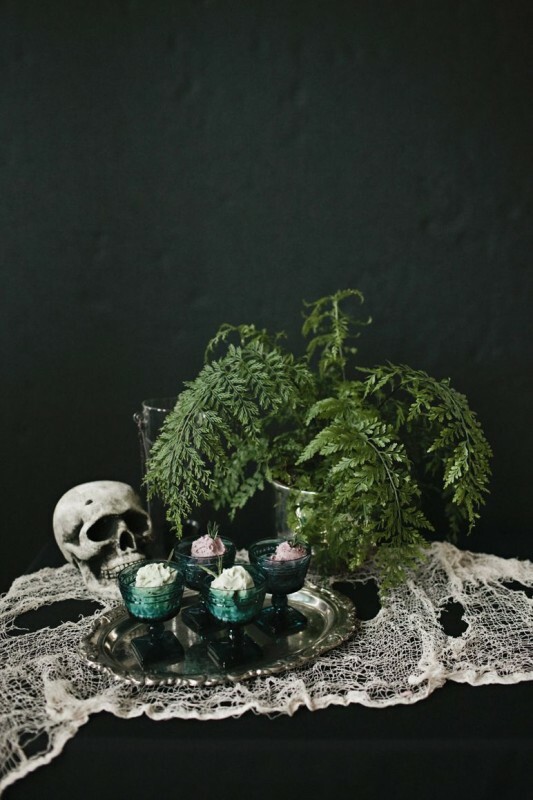 No dinner party is complete without a dessert table, this one featuring cobweb-like netting and a skull to truly inspire the Halloween party mood, as designed by Cassandra LaValle of Coco Kelly. 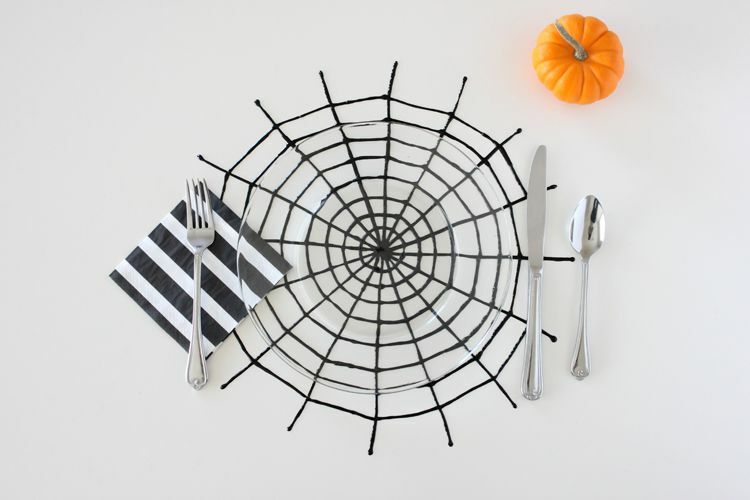 Get crafty with your table decor, like these adorable spiderweb placemats from Delia Randall of Delia Creates. 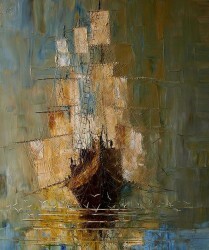 All it takes is a little bit of puff paint, some wax paper, and a steady hand. 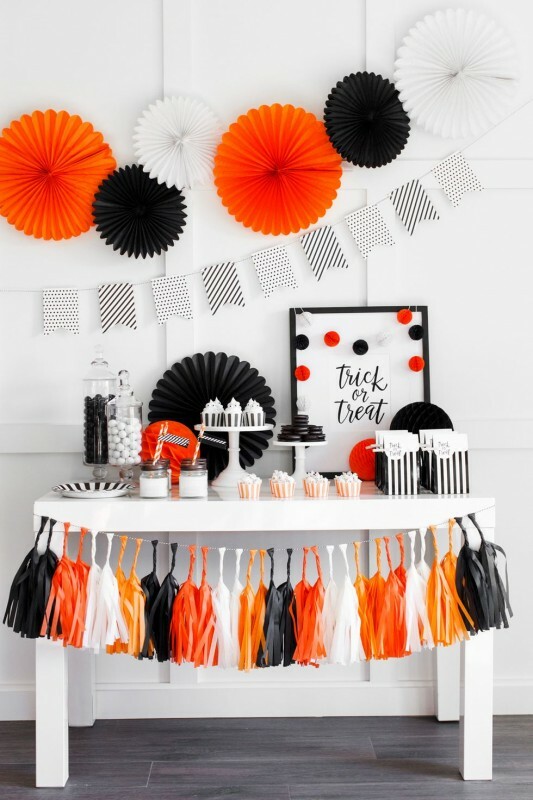 The Tomkat Studio dressed up their dessert table in traditional Halloween colors, but jazzed it up with a tasseled table skirt and two different types of bunting. Embrace the rustic look as Pink Peppermint Designs did here, with mismatched chairs, a dramatic floral centerpiece, and candelabras on either end of the table. 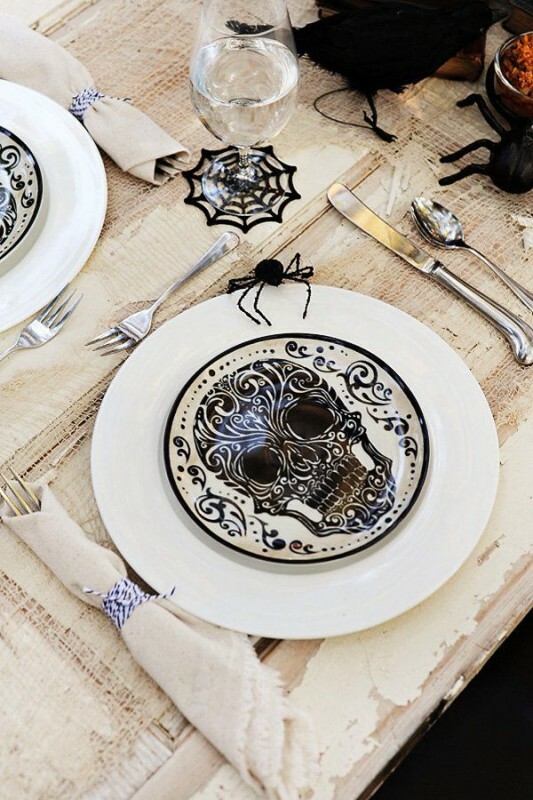 Although Mexican sugar skulls are a motif used for the Day of the Dead, they make an excellent addition to a Halloween table, as Pink Peppermint Design demonstrates. 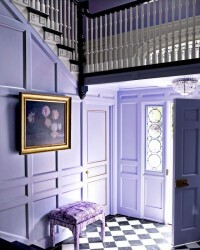 Since the design itself is incredibly intricate, stick to a simple black-and-white color palette. 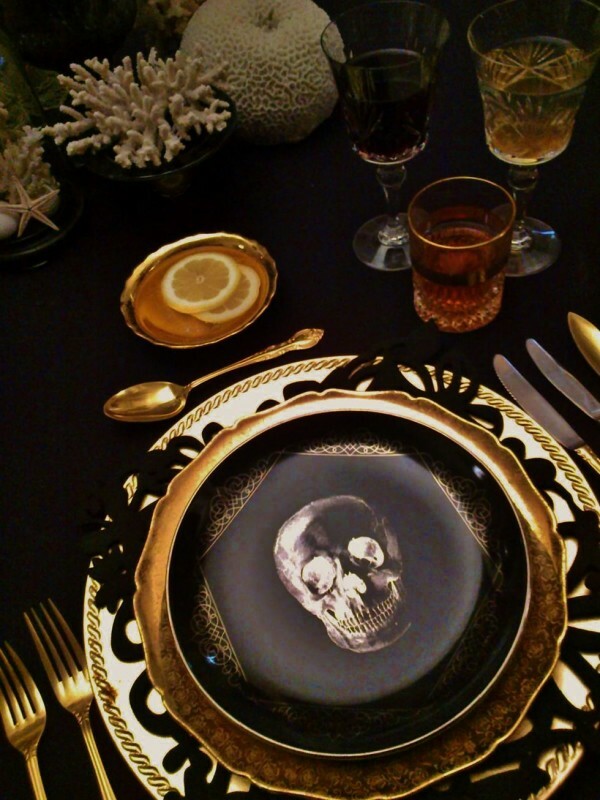 Place a skull on each platter, like Hostess with the Mostess did here, and your guests will be in for an excitingly scary evening. 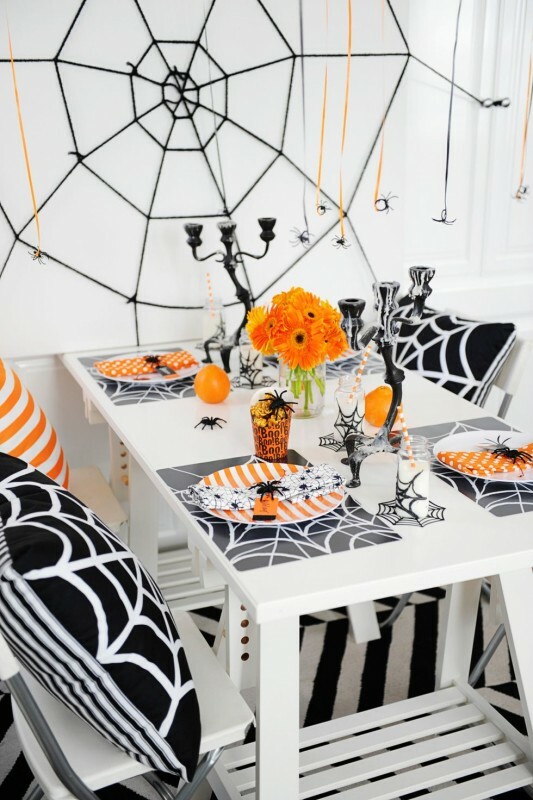 Create a cozy Halloween dinner table like this simple and chic setup by Pink Peppermint Designs. 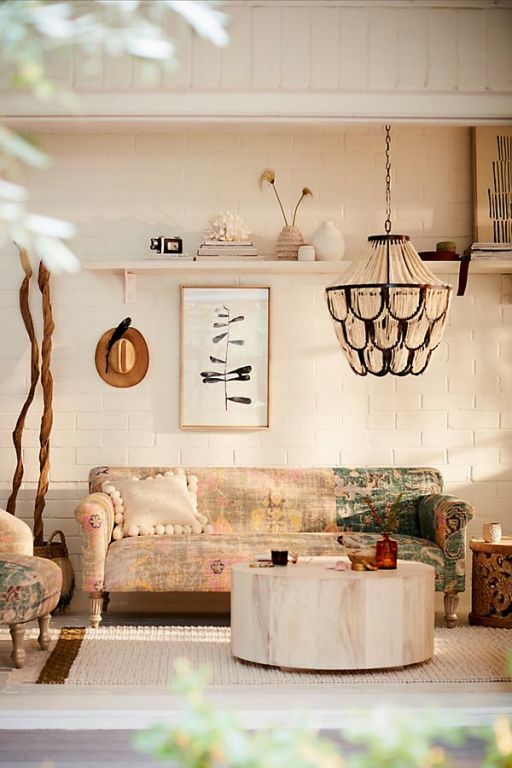 Add pillows, flowers in a mason jar, and fun place settings for a more casual atmosphere.